Harini Nagendra and Seema Mundoli from Azim Premji University, and Vijay Nishant, Project Vruksha, conducted a study of trees to be felled for Jaymahal Road widening and proposed steel flyover. According to government documents the number of trees to be cut was estimated to be 1668. But an independent survey by citizens done between October 2016 and January 2017 estimates the number to 2244, and 205 saplings, all belonging to 71 species and 26 families. The report prepared by the team also lists out the number of trees to be cut, their species, scientific names etc,, and the environmental impact that can result. Read the full report below. Meanwhile, citizens can file objections to the cutting of as many as 112 trees on Jaymahal Road. In a notification, Assistant Conservator of Forests and tree officer of the BBMP, says that people can send their objections to acfsubdivision1bbmp@gmail.com through email, or can call 9480685381 within a period of 10 days, from February 6th. 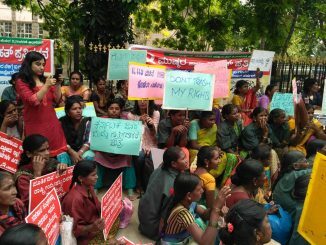 More than 1000 contract Powrakarmikas protested at BBMP head office on Womens’ Day. BBMP finally agreed to weekly off , direct payment of wages from BBMP for workers, and assured that arrears and revised wages will reach workers within a month. 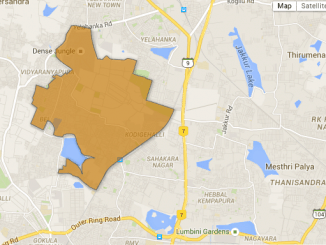 What were the works done in Vidyaranyapura ward in the last five years? How much money was spent? What are the issues troubling the residents?